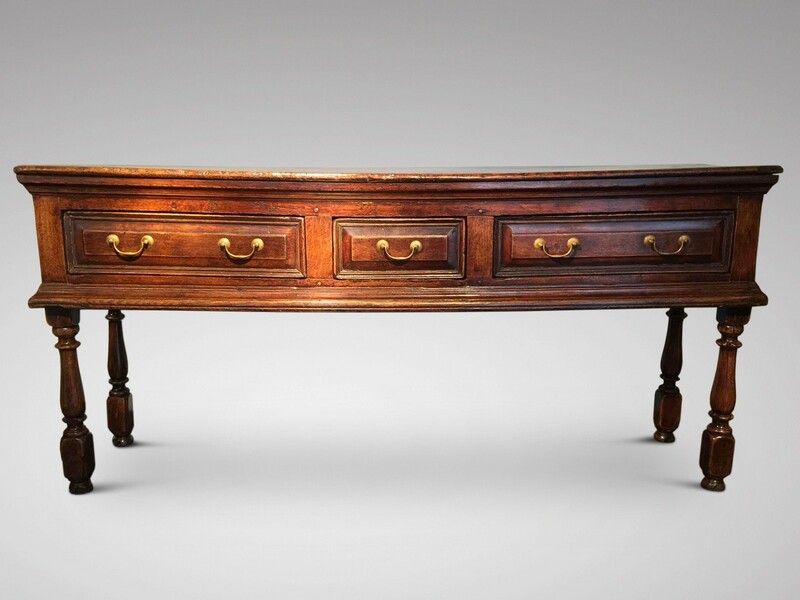 An 18th century oak Dresser Base with a rectangular two plank top over three drawers with brass swan neck handles, raised on four turned baluster legs. Superb quality with a lovely mellow honey patina. Anthony Short Antiques first opened an antiques gallery 21 years ago in Antwerp. I am following my father's footsteps, having been in the antiques trade for more than 50 years in Knokke-Zoute, Belgium. In 2008, I decided to move with my family to Petworth in the UK and left my successful shop in Antwerp to start up a whole new adventure. In June 2008 I started first dealing in antiques from our small premises in East Street, Petworth. 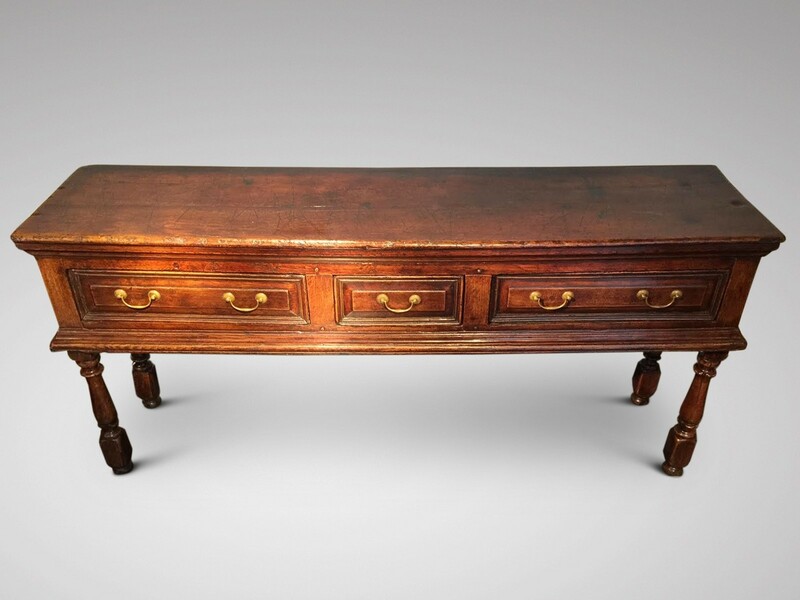 Having looked for some time, I found a large showroom nearby the Market Square in Petworth, ideally suited to display my large stock of antique furniture and works of art. It was now time to start another new challenge, as I have decided to open a shop in the heart of Bruges, Belgium. The new gallery is located in the centre of Bruges on the Burg, opposite the Town Hall and The Basilica of the Holy Blood. I still live and work in the UK and clients are welcome to view items by appointment. I will continue to attend my usual antique fairs on the continent, the Art Nocturne Knocke Fair, Eurantica in Brussels and Antica in Namur to keep in contact with my loyal clientele. "It is thanks to them that I am where I am today!". I hold a large and varied collection of 18th and 19th century quality antique furniture, featuring fine antique mahogany furniture of the Georgian, Regency and Victorian periods embracing designs by Chippendale, Sheraton and Hepplewhite, featuring fine walnut furniture of the Queen Anne period, English and Continental Oak and Country furniture, decorative antique objects, antique prints and antique silver. Buy with confidence. 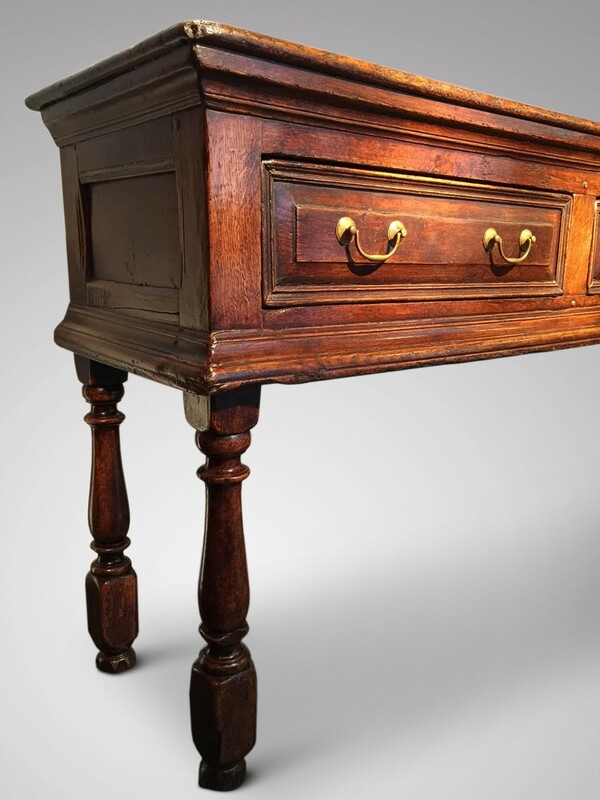 Over two generations in the antiques trade we have built a reputation for dealing in quality antiques. With every purchase we provide a certificate with description to ensure our customers are satisfied with a genuine purchase. 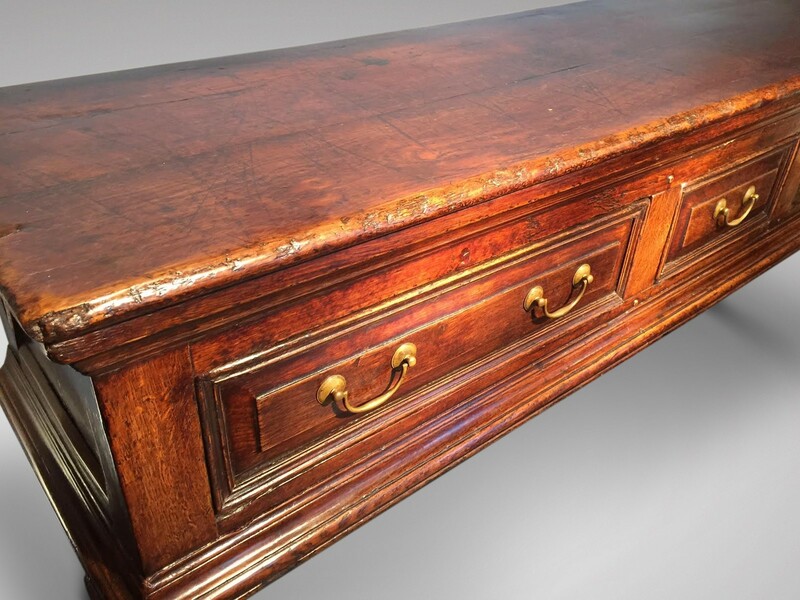 All our items are genuine antiques which we buy specifically with a keen eye on contemporary trends to complement modern living and interior design. We hold a much larger stock than is shown on this web site so please contact us if you are looking for anything in particular. 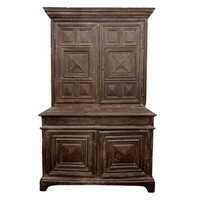 17th c Leggy north country oak dresser .